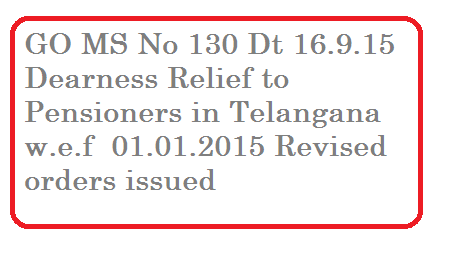 GO MS No 130 Pensions – Dearness Relief to Pensioners in Telangana with effect from 01.01.2015 – Revised – Orders issued. (ii)Those who retired prior to 01.07.2013 and whose pension was consolidated in the light of orders issued in the G.O. 3rd above. Government also hereby order the revision of rates of Dearness Relief from 77.896% to 83.032% with effect from 01.01.2015 to the pensioners who are drawing their pension in revised pay scales, 2010 and not consolidated in terms of the orders issued in the reference 3rd read above. Government also hereby order the revision of rates of Dearness Relief from 191.226% to 201.588% with effect from 01.01.2015 to the pensioners who are drawing their pension in revised pay scales, 2005 and not consolidated in terms of the orders issued in G.O.Ms. No.100, Finance (Pen.I) Department, dated.06.04.2010. Government also hereby order the revision of rates of Dearness Relief from 196.32% to 205.318% with effect from 01.01.2015 to the pensioners who are drawing their pension in revised Pay Scales, 1999 and not consolidated in terms of the orders issued in G.O.(P). No.248, Finance (Pen.I) Department, dated.04.10.2005. Government also hereby order the revision of rates of Dearness Relief to the pensioners who retired while drawing UGC Pay Scales 2006 from 01.01.2006 from 107% to 113% w.e.f. 01.01.2015. Government also hereby order the revision of rates of Dearness Relief to the pensioners who retired after 01.01.1996 drawing UGC Pay Scales 1996 from 212% to 223 % with effect from 01.01.2015 since the Dearness Relief was regulated upto 01.01.2007 by merging 50% Dearness Relief with basic pension through G.O. (P) No.183, Finance (Pen.I) Department, dated.23.07.2007. Government also hereby order the revision of rates of Dearness Relief to the pensioners/family pensioners whose pension was consolidated as per orders issued in G.O.Ms.No.54, Higher Education (UE.II) Department, dated. 08.06.2011 and G.O.Ms.No.31, Higher Education (UE.II) Department, dated 24.05.2013 from 107% to 113% with effect from 01.01.2015. Government also hereby order the revision of rates of Dearness Relief sanctioned in G.O.Ms.No.4, Law (Law & J-SC.F) Department, dated. 06.01.2011 to the Pensioners who a r e drawing pension as per Justice E.Padmanabhan Committee report from 107% to 113% with effect from01-01-2015.